It was one of those enchanting, Flagstaff winter days around the first week of December. Usually we didn't get a lot of snow until after Christmas, but in the wee hours of the morning the flakes had begun to quietly, gently dance downward and pile upon the cold earth, deepening into a downy blanket. School was cancelled because the snow was predicted to continue well into the night. 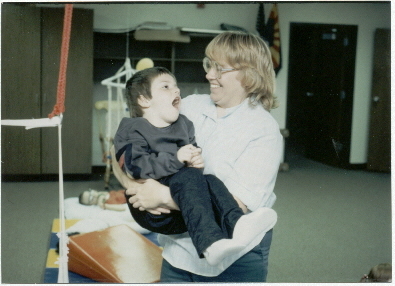 I was working as a paraprofessional in my little boy's classroom at the time, so we were both delighted to get an unexpected day off. Soon after I got out of bed and started the coffee, I could hear him making soft sounds to let me know he was awake. 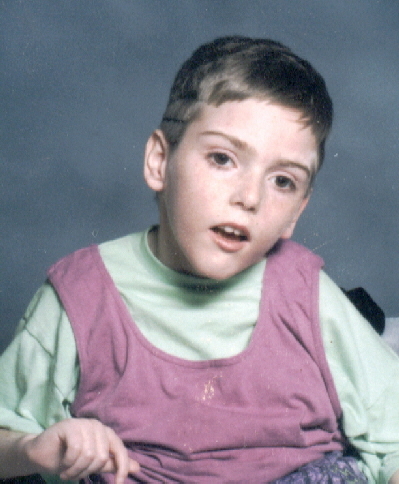 Tee was nine years old and had cerebral palsy, which had caused him to be quadriplegic with multiple medical challenges, and he was unable to speak, but he would make sweet, cooing sounds in the early morning hours, sounds which never failed to melt my heart. "Hey, my Tee boy! Guess what? It's snowing outside and we don't have to go to school today!" I snuggled in next to him and held him for a few minutes. Such a tiny guy, just the right size for holding. 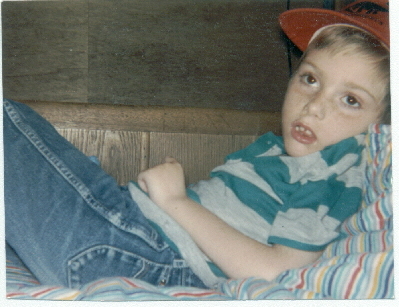 Because of his disabilities, he only weighed about 35 pounds. He smiled and pushed his feet against me. Time to get up! It was a perfect day to bring out the decorations and get our home ready for the holidays. After breakfast I turned on some Christmas music, put Tee in his wheelchair, and hand over hand, together we decorated the tree. He seemed to enjoy it, as a contented smile played on his lips. I hadn't had much time to do any baking yet, since I was going to the university to finish courses for a teaching degree in addition to working full-time. The next project for the day was making cut-out cookies and decorating them. Our tiny home was filled with the wonderful aromas of freshly cut evergreen and cookies baking. I took Tee out of his chair and put him on his beanbag next to the tree, so he could see the lights. We weren't sure how much he could really see, although it was evident that he could see bright, sparkly things. 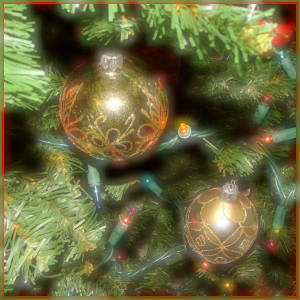 His beautiful, huge brown eyes shimmered in the reflection of the blinking lights on the tree. What an angel, I thought! How blessed my life is because of this precious child. I breathed a prayer of thanks to the Lord through my grateful tears as I kissed Tee’s silky hair. Knowing in my spirit that each day with him was a gift, I held the moment in my heart so that I would never forget it, storing it away like a treasure in my memory. Little did I know that, in years to come, that memory would be one of the things left to hold onto after he had left this world for his heavenly home. There was a knock on the door. I opened it, expecting to see the eager face of one of the neighbor children offering to shovel the snow from our driveway (in exchange for cookies!). Instead, there stood a somewhat bedraggled man. He wore a threadbare coat and a black stocking cap pulled down over his ears. His hair poked out from beneath the hat in greasy-looking strands, and he had several days growth of beard. In an effort to appear non-threatening, he stood well away from the door. "I'm sorry to bother you, ma'am. I'm just passin' through and heard your Christmas music playin' and wanted to ask if you might help me. I haven't had anything to eat for awhile--kinda down on my luck," he stammered and looked down at his wet, worn out shoes. I have to admit he made me a little nervous, but how could I turn him away? It was as if he was sent to us at this precise, chosen moment. I asked him to wait on the porch while I got him something. We didn't have a lot of food in the house. My job paid little more than minimum wage, and I was trying to get through college. Looking through the cupboards, I found peanut butter, jelly, and bread and made him a couple of sandwiches. The cookies had cooled, so I added some of them to the bag, as well as an apple and filled a travel mug with coffee. I remembered that I had an extra pair of work gloves that would surely be large enough to fit him, so I added those to the package. Well, it wasn't much, but at least he wouldn't be hungry. Just as I was closing up the bag, I noticed a small New Testament Bible lying on the coffee table, so I tucked it under the sandwiches. As I handed him the food, gloves, and coffee, his face brightened into a shy smile. The large flakes continued to fall, muffling the sounds of the wind through the pines and the distant crunching of tires in the snow from passing cars. Our eyes met. "Thanks so much! And I'll be prayin' for you and that sweet little boy of yours, too." He walked away and disappeared into the thickening blizzard. Immediately the scripture came into my mind, "Don't be forgetful to entertain strangers, for some have entertained angels unawares." Whoever he was, it felt good to be able to help someone else in some small way. I reflected on how much we truly had. Our home was warm and filled with joy. The bills were paid for the month. We had enough food, and were able to give a few cans of vegetables to the food basket project at school as well. Tee's health had been better than usual, even though he'd had to have surgery on his hip and it had been a very frightening, tense time. And we were getting ready to take a trip to California to spend the holidays with family and friends there. God had been good to us, and my heart was filled with gratitude. We had a great vacation, even though money was tight and we had to drive straight though rather than stopping at a motel along the way. Tee loved traveling, and was always pleasant and had kind of a perpetual grin on his face the entire time. It was good to get away from the cold, the pressures of school and work, the daily routine, and to bask in the warmth of our large family. When we arrived home again a couple of weeks later, in the icy cold beginning of January, I was a little wistful. Back to the old grind. There would be a pile of bills waiting in the mailbox. A new semester of school and tons of homework lay ahead. Payday was still a week away, and the cupboards were now starting to look like Mother Hubbard's place. I sighed as I carried Tee into the house and prepared to unload all our stuff from the car. As I eased him onto the sofa, something about the house seemed different. I glanced into the kitchen and saw a box on the table that hadn't been there when we left. It was filled with canned goods, bread, peanut butter and jelly! There was a note attached. We had this food left over from the food drive at school. Wow! I was flabbergasted. I'd never expected anything like this. As I opened the refrigerator, I saw that they had also added a ham, eggs, milk, and cheese. We had enough food to last us at least a month! Laughing out loud, I picked Tee up and danced around the room with him, as I told him our good fortune. He smiled his rare and precious smile as he snuggled against me. There was a knowing look in those deep brown eyes. Somehow I felt that he'd known all along that things were going to be just fine. It had been a Christmas of miracles for us. And I held the best and brightest miracle of all in my arms. Do you know how much you still do? Not a day goes by that I don't think of you, of you. You know, do you know? With your love, your love. Materials on this page not to be used without written permission. Click on picture to go to Tee's memorial page.